If you missed my post on Venice, you can catch it here! 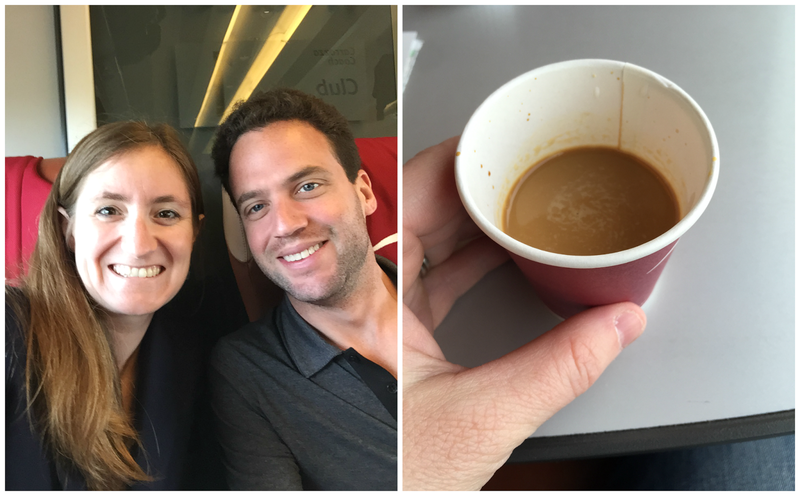 We continued our Italy trip by taking the train from Venice to Rome! We decided to go with the upgraded first class tickets, which were only $30 extra, and had roomier seats, included drinks and free wifi! The train ride was nice and relaxing and we saw some beautiful views of the countryside from the train. On the train we received welcome drinks and I had a shot of espresso for mine. I am going to write about all the food we had in a separate post, but let me just say something about the coffee real quick! The coffee in Italy is amazing. In all seriousness, this shot of espresso from the train was better than any coffee I’ve had in the U.S. and that was just train coffee! So that just tells you something about the quality of the coffee all over Italy, it’s just simply awesome. 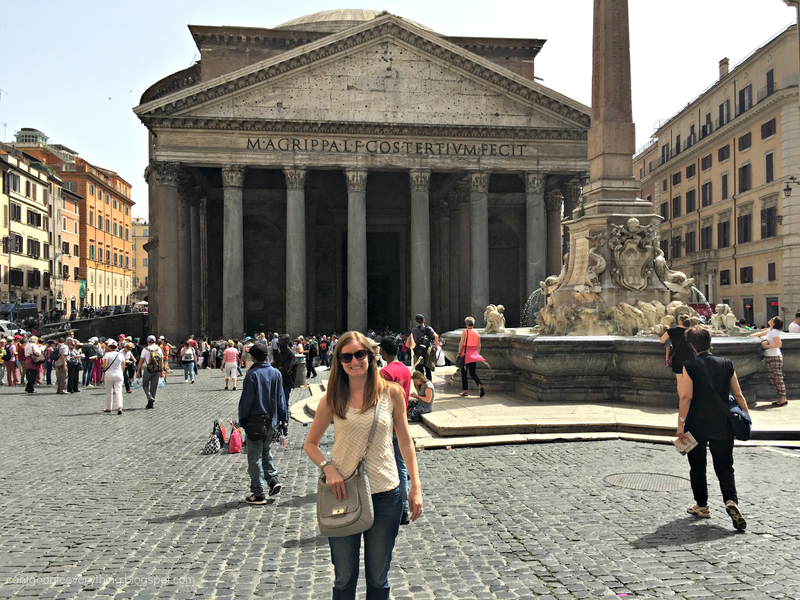 Our first stop in Rome was to see the Pantheon, which was a very reasonable walking distance from our hotel! The building is just really cool and it’s amazing how old it is! Inside they have also converted it to a church (as are many old building in Rome) and you can see the burial site of the Renaissance artist Rafael. Everywhere you go in Rome there are plazas with artwork such as obelisk or fountains in the center like the one in this photo! Many of the obelisk are Egyptian which were taken from Egypt during the time when the Roman Empire took it over. 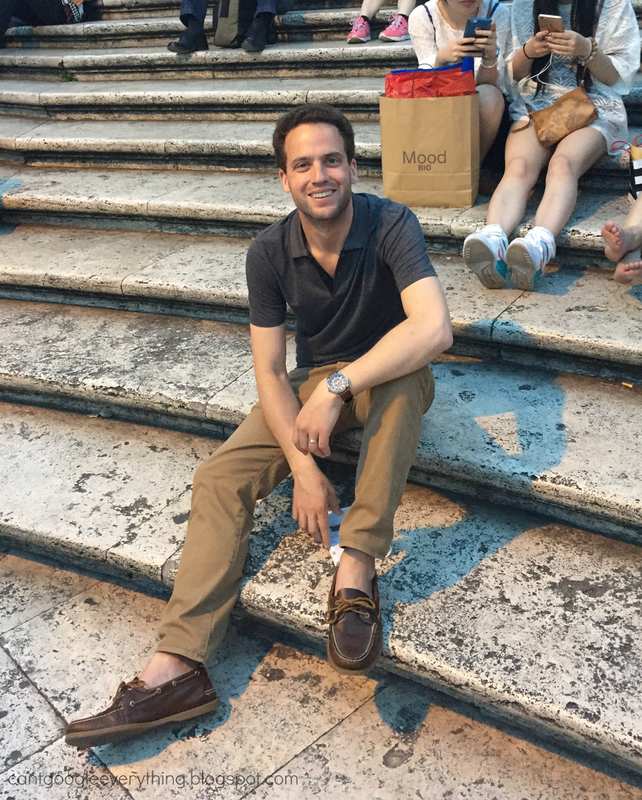 That night we headed out to dinner and walked along the shopping area towards the Spanish Steps. If you climb to the top and turn around you can see the upscale shopping such as Prada at the bottom of the steps! One really interesting thing about Rome is the juxtaposition of old and new everywhere you go! There are ancient ruins right next to modern traffic flying by. Renaissance and Baroque era fountains next to modern shopping and restaurants. It’s just really cool to see! The next day we went to the Vatican. We opted for the paid guided tour, which is totally worth it! 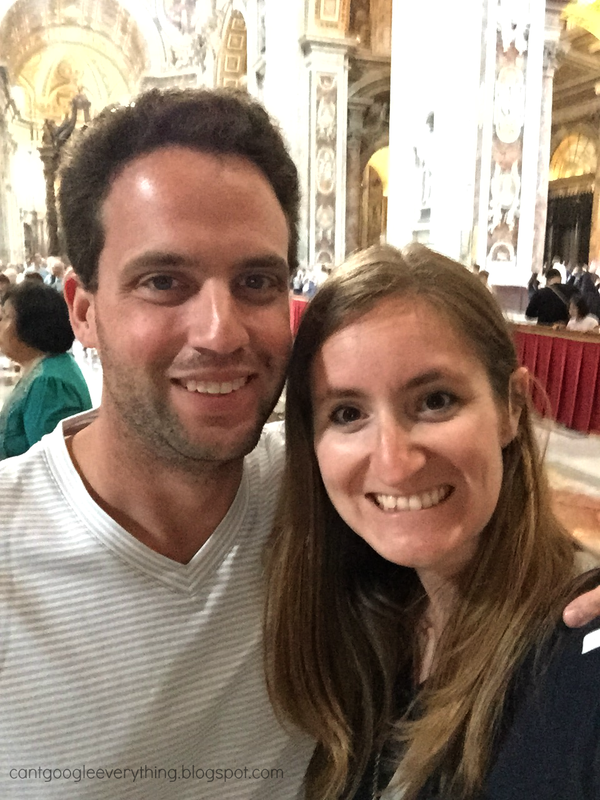 You get to skip the line into the museum and into Saint Peter’s Basilica plus she was very knowledgeable. 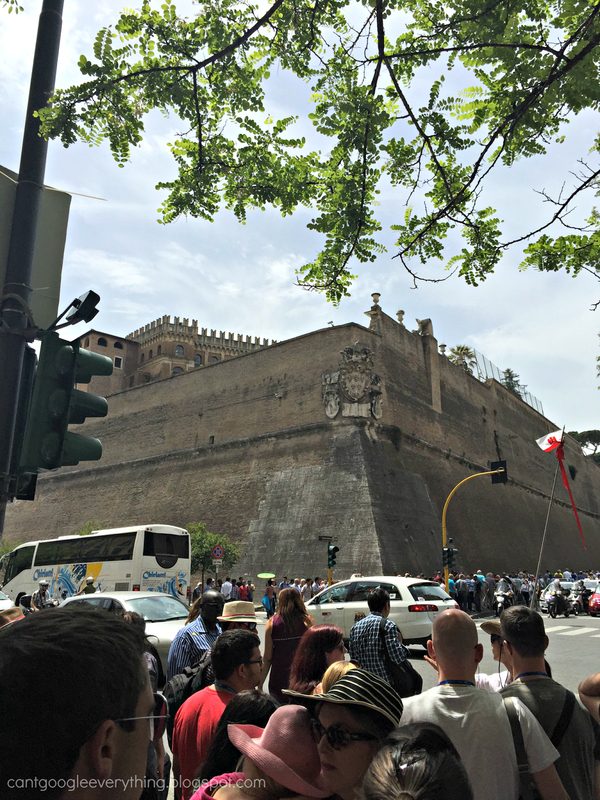 By the way, the line into Saint Peter’s was huge, at least two hours long and standing outside in the hot sun- so getting a tour is the way to go! Our tour guide told us that somewhere around 25,000 people on average visit the Vatican every day. Needless to say, it was very crowded and very hard to get any good photos without a ton of people in them! 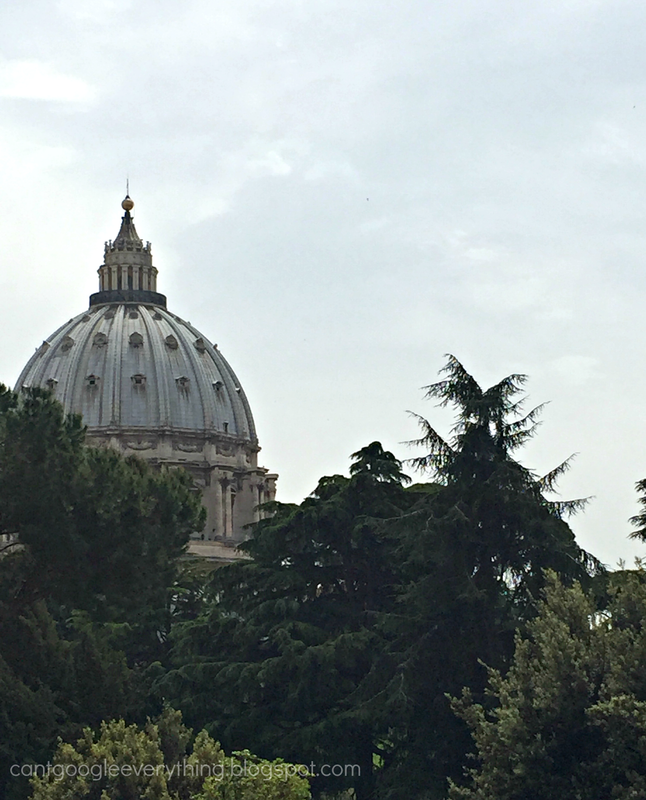 This is a view of Saint Peter’s from the courtyard you walk through after going through the museum’s entrance/ticket area. 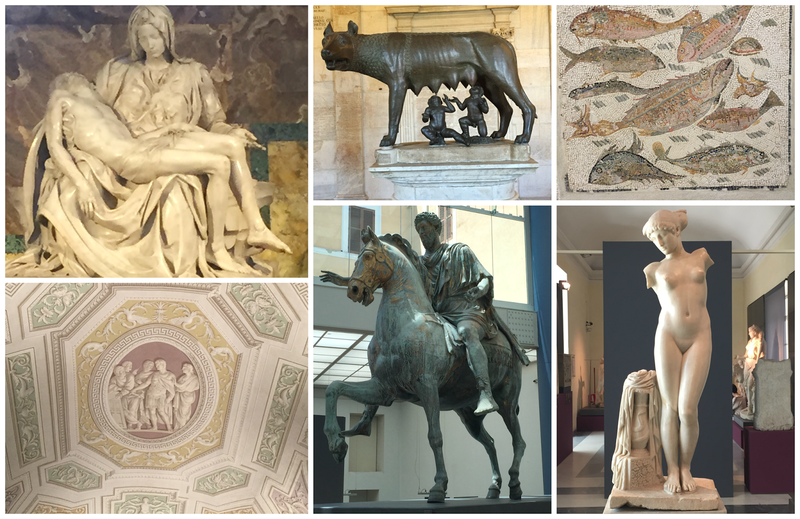 The museum itself had an amazing collection of artwork including art from the ancient times and Renaissance! It was really interesting ad it would have been nice to see more, but it was just so crowded and our tour guide kept us moving right along. We also went through the Sistine Chapel, but you aren’t allowed to take photos in there. We went to so many art museums there, I really lost track of what they are all called and which days we went to each! But I did take some photos and these are a few of my favorites! From top left and then clockwise: Pieta by Michalangelo (Saint Peter’s Basicalla), Romulus and Remus with the She Wolf, a Fish Mosaic, a Ceiling in the Vatican Museum- this is 100% painted on by the way, bronze statue of Marcus Aurelius (one of the oldest full bronze statues still remaining from the ancient times!) and a statue of Venus. 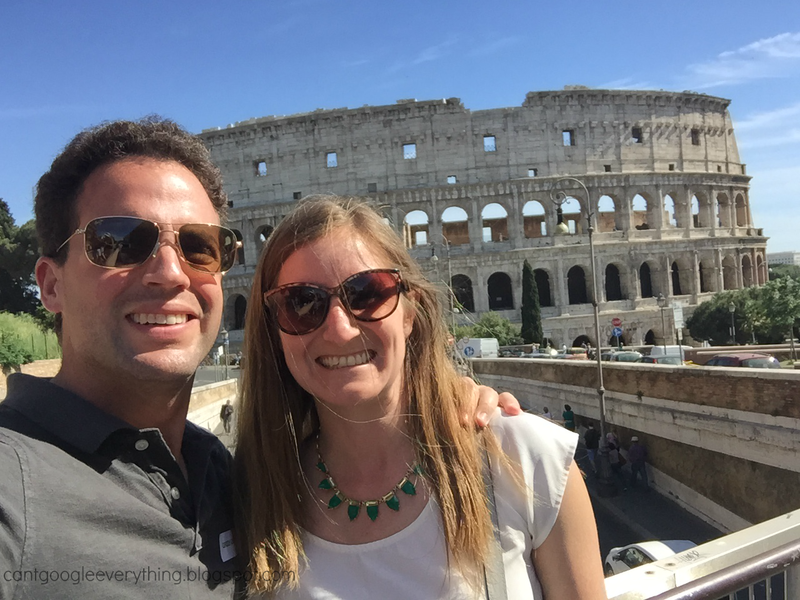 Of course no visit to Rome would be complete without going to the Colosseum! We did a tour group for this as well, which was pretty good because the tour guide really knew his stuff. 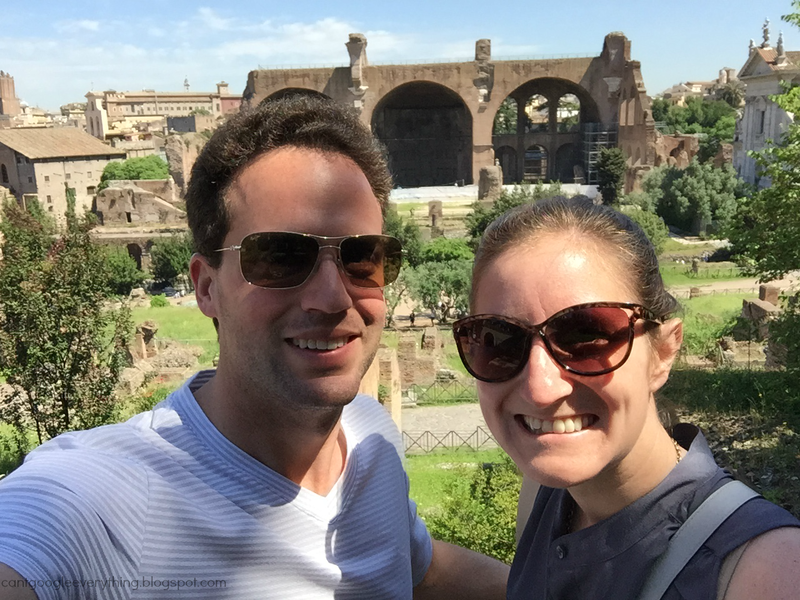 The tour also included a visit to see the chains of Saint Peter, and that church also had a very cool sculpture of Moses by Michelangelo! A view from inside the Colosseum. The floor, of course, is modern and built to show what it would have looked like when the floor was put in for the “entertainment.” Our tour guide chose this part of the tour to tell us that he was once part of a team of archaeologists who worked on the Colosseum some 25 years ago! Last but not least was a visit to the Roman Forum. This was one of my most favorite things to see, even though it was super hot and a lot to take in! I will be doing a short video “tour” of this are on youtube soon for anyone who is interested in seeing it because it’s just too many pictures for this blog post! Wear comfortable shoes! There is a lot of walking involved and not all the streets are even. I wanted to wear my cute Tory Burch flats but that wasn’t happening with all the walking so I ended up wearing my sandals most of the time. Locals don’t really wear sandals so it makes it extra obvious you are a tourist, but I’ll take that over blisters! Be sure to have cash on hand! Several of the tourist spots only took cash for tickets, plus its good to have if you want to take a cab. By the way the cabs were all very nice and charged fairly, we didn’t have any issues with that. It’s pretty hot there, we went in May and it was in the mid 80s so be prepared! On the other hand, you are not supposed to go into the churches and several other spots with your shoulders uncovered so if you plan to wear a tank top, bring a light sweater to throw on when you enter a church or other holy spot! By the way, we stayed at a really cool hotel which is worth mentioning! It was modern chic and upgraded nicely. The rooms weren’t gigantic but just right. They also included free unlimited mini bar, an espresso machine in the room and they brought us a giant breakfast to our room every morning! It’s called Casa de’Coronari. The owners were also very nice and super helpful as well and it’s close to the Pantheon and Trevi Fountain. 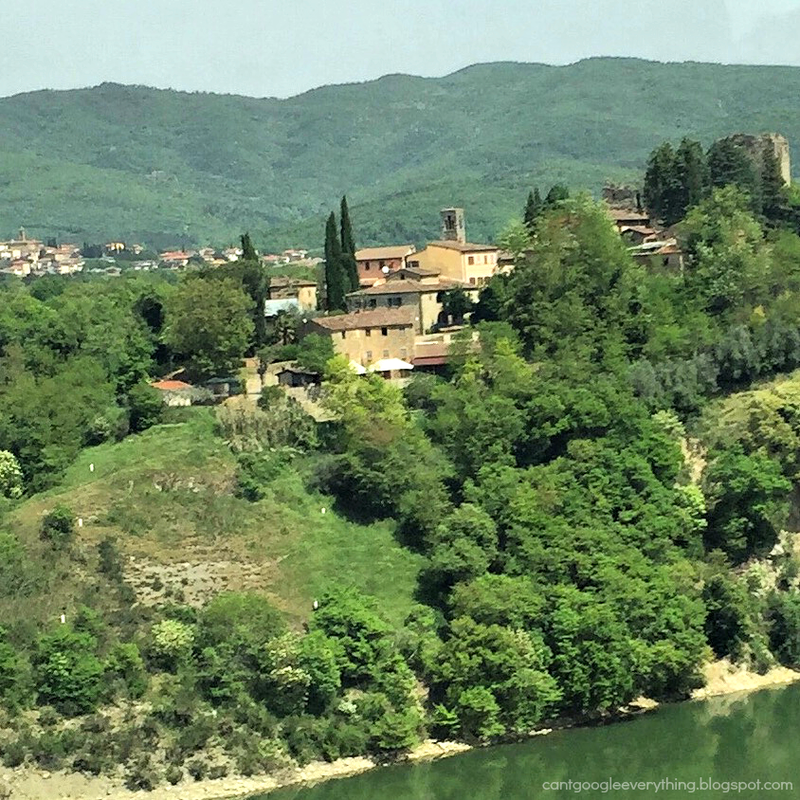 When we left Rome we rented a car and headed out for a drive around Tuscany! I’ll share more about that in my next post and then I’ll share about some of the food and drinks! Ciao! So beautiful! I've been to Florence but never Rome! I'd love to go! Wow, it's amazing how old some of those buildings are. I loved reading this post because I took Art History in college and you actually pictured a piece we learned about! So cool! As a Catholic, I would absolutely love to visit the Vatican. Thanks for sharing your experience! What a great trip! Rome is a lot of fun. Thank you so much for sharing your visit. It has reignited my desire to revisit Italy, and specifically Roma. i love old world/new. it's so beautiful. im happy you shared some art that you saw. that's definitely what i would do if i was there… and shop, of course! I’ve never been to Rome, but now I feel like I’ve tagged along on your trip. Well, almost. 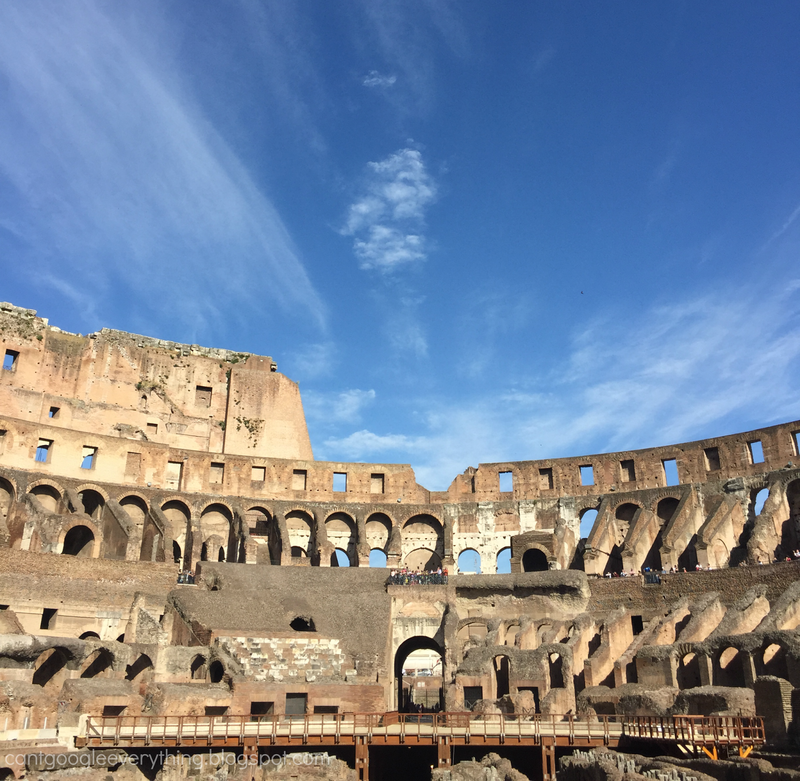 Wonderful pictures, especially the Collosseum and the blue sky! Now, about the coffee: once upon a time (it was the year 1983), an American went to Milan. He LOVED the espresso and the places that made them. He couln’t get the experience out of his head. He went back to the States. The rest is history. You know who I am talking about, right?